To celebrate the AtariAge release of Anguna, I'm having a contest/drawing for an Anguna poster, featuring the Anguna box art designed by Tim Lapetino (author of The Art of Atari)! To enter, send me a photo/screenshot of you completing Anguna. I will randomly draw one entry from those submitted, and I'll send a poster to the winner. You can can download the game from http://www.bitethechili.com/anguna2600 - BUT if you bought a copy from AtariAge I will enter your name twice into the drawing. (either send me a photo of you playing the cartridge version, or if you ordered one and it hasn't arrived, just let me know). Just a reminder that the last day to enter is this Thursday! Congrats to FroggoGamer for winning the poster! I'll send it out shortly. And thanks to everyone who played through the game! I can't tell you how much it means to me. I love adventure style games, and Anguna delivers. I have also enjoyed Ature and the Adventure remakes, too. I had time to play the game this month, fantastic, I ordered it from Al last week. I won but I can't find the lantern. 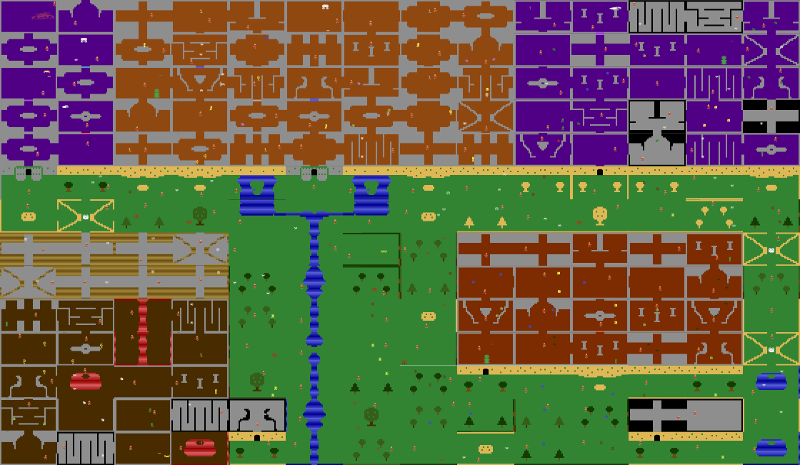 It's in the second dungeon (upper-right dungeon), you work your way right, then double back left and down. It's 2 rooms directly left of the 2nd dungeon's start room.